Jefferson Lab's technology stewardship event: Accelerators: Driving Applications for Society offers a unique opportunity to hear the many ways that accelerators, originally developed for research, can now be used to address national and international priorities, including Environmental Cleanup, Advanced Materials for Industrial Applications, Medicine and Health, Alternative Energy, and National and Homeland Security. Dr. Robert Hamm, our keynote speaker, is the editor of Industrial Accelerators and Their Applications, and he will be giving his perspective on Worldwide Utilization of Industrial Accelerators. The interactive panel discussion format will allow participants listen and engage with top experts from industry, universities, and from the entrepreneurial and venture capital communities, highlighting the applications of advanced accelerators beyond that of scientific research and how industry and national labs can work together to move these applications to market. 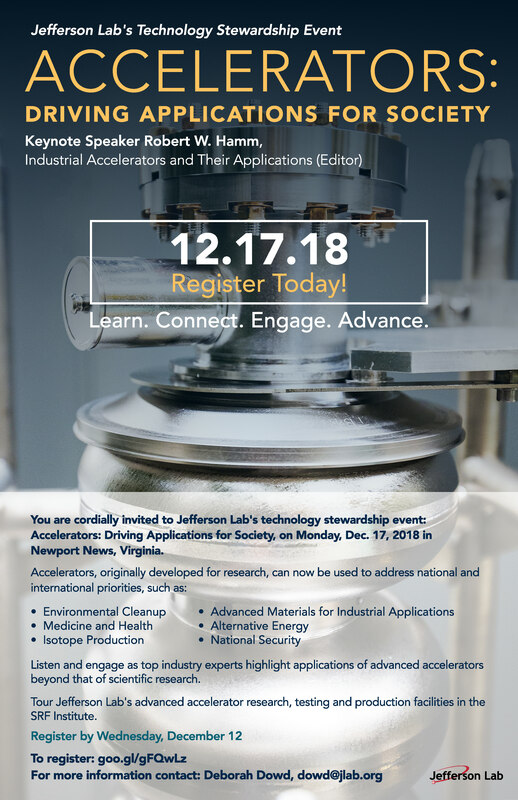 A tour of Jefferson Lab's advanced accelerator research, testing and production facilities in the SRF Institute will be offered to registered attendees.